"The Barons: The Northwest's First Hit-Making '50s Teen Rock 'n' Roll Group"
"The Gallahads: Seattle's '50s Doo-wop Kings"
"Northwest Rock: The Great Eruption of '59"
"'High School USA' (Seattle / Portland) (1959)"
"Seattle Bandstand debuts on KING-TV on March 16, 1958"
"Ron Holden: Seattle's Sweet '60s Teen Balladeer"
"Lola Sugia's "Blue Tears" 45 (1960)"
"The Swags: Bellingham's First Rockstars (1958—1960)"
"Pat O’Day: The Godfather of Northwest Rock?" 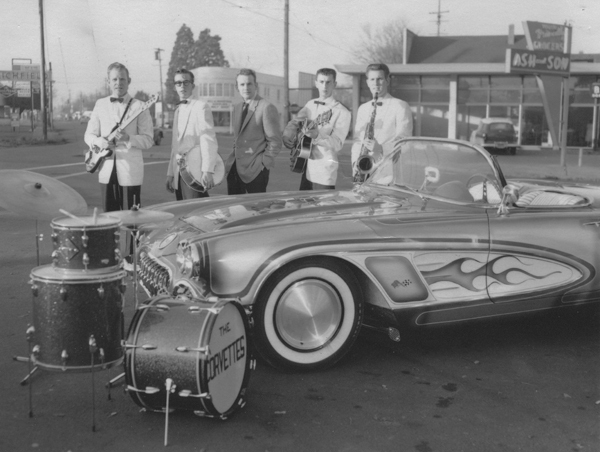 "The Checkers: Yakima's Rockers (1958—1962)"
"Inland Empire Rock: The Sound of Eastern Washington"
"The Dynamics: North Seattle's Top '60s Teen-R&B Band (1959—1968)"
"The Fabulous Chancellors: Boise's Rocker Boys (1961—1965)"
"Nancy Claire: The First Lady of Northwest Rock"
"Merrilee Rush: The Angel of The Morning"
"Merrilee Rush's Biggest Hit enters Billboard Charts on May 4, 1968"
"Century 21 Expo: Elvis Presley's arrival in Seattle draws throngs on September 5, 1962"
"Century 21 Expo (1962) Seattle's September Days with Elvis Presley"
"Lake Hills - Bellevue's Rockin' Roller Rink (1963-1980s)"
"The Counts: Ballard's Best R&B Band (1958—1966)"
"Tom Ogilvy, Seattle's Original 'Record Man' (R.I.P. 2000)"
"The Raymarks & Bremerton's Rockin' Roots (1960—1966)"
"The Beatles in Seattle (1964)"
"Jini Dellaccio: Iconic Photographer of Northwest Musical Icons"
"The Bards' 'British Invasion' Days (1966)"
"Alexys, Seattle folk-pop singer, opens big Beach Boys & Yardbirds concert at the Coliseum (1966)"
"Rockin' Robin Roberts, former singer with Tacoma rock band, the Wailers, dies in an automobile accident on December 22, 1967"
"Lake Hills Roller Rink burns after dance on July 30, 1968"
"Led Zeppelin rocks Seattle's Green Lake Aqua Theatre on May 11, 1969"
"It's A Beautiful Day's Seattle-penned song, "White Bird," hits the Billboard charts on October 4, 1969." "Northwest Rock: The Reunion Concert of '72"
"Northwest Rock: The 'Great NW Rock and Roll Show' of '80"
"Punks Rock: Seattle's First DIY Show (1976)"
"Iggy Pop & David Bowie Rock The Paramount (1977)"
"Bruce Springsteen Rocks Seattle's Old Timers' Cafe with Tavern Band (1980)"
"Same Love: A Brief History of Quer Musicians in the Northwest"
"Sweet Madness: Spokane's Lost New Wave Kings (1978-1981)"
"Nirvana places 'Drummer Wanted' classified ad in The Rocket magazine (May 1988)"
"Kurt Cobain (1967-1994): The Northwest Rock 'n' Roll Icon"
"Nirvana debuts new song, 'Smells Like Teen Spirit,' at Seattle OK Hotel on April 17, 1991"
"Crocodile Cafe Opens on April 30, 1991, as Grunge Rock Scene Erupts"
"Crocodile Cafe: Seattle's Grunge Rock Era Icon"
"Neil Young's iconic anthem 'Rockin' In The Free World' makes its public debut in Seattle Concert on February 21, 1989"
"Pearl Jam performs debut gig at Seattle's Off Ramp Cafe on October 22, 1990"
"Nirvana's Live & Loud MTV Concert rocks Seattle's Pier 48 Warehouse (1993)"
"The Sonics Reunite At Paramount Theater In 2008"